Exemptions are used when there is no exchange of money. There are several options. You must choose the exemptions that most closely resembles your situation. There may not be an exact option. You are asked to choose the choice that you feels is most appropriate. If money is exchanged, an Affidavit of Property Value is required to be submitted with the Deed to be recorded. 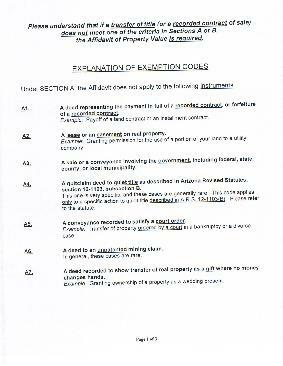 If an Affidavit of Property Value is used, an exemption code is not referenced.